In this tutorial, I am going to create a userform that will change a selected cell’s text case. Three type of cases I have used here: Upper Case, Lower Case, and Proper Case. You know what Upper and Lower cases are. The Proper case is changing the first letter to Capital of every word in the text. Choose Developer ➪ Code ➪ Visual Basic (or press Alt+F11) to open the VB Editor window. Double-click on the workbook’s name in the Project window to activate it. In the VB Editor, choose Insert ➪ UserForm. An empty new form named UserForm1 is created by the VB Editor and the Toolbox is displayed. Now, add an OptionButton control and then change the following properties. By default, this option will be active, so its Value property should be set to True. Adjust the size and position of the controls and the form until your UserForm looks like the UserForm shown in the figure below. The controls must not overlap. The UserForm looks like this after adding some controls and properties. Sometimes it is necessary to make several controls look alike. For example, in the created UserForm, the two CommandButtons should be the same in size and alignment. Same should be for three OptionButtons. The VB Editor provides several useful commands to help you size and align the controls. For example, we’re going to give three OptionButtons same size and alignment. Pressing CTRL select three OptionButtons and right click on the selection. You can also format choosing a command from the Format menu. See below. You can format several controls using commands under Format menu to give them the same look. Well, our UserForm has all the necessary controls. Now, it’s time to display the UserForm. While you’re creating the UserForm, press F5 to display the UserForm and see whether it looks like what you want. Click the Close button (X) in the title bar to close the UserForm. 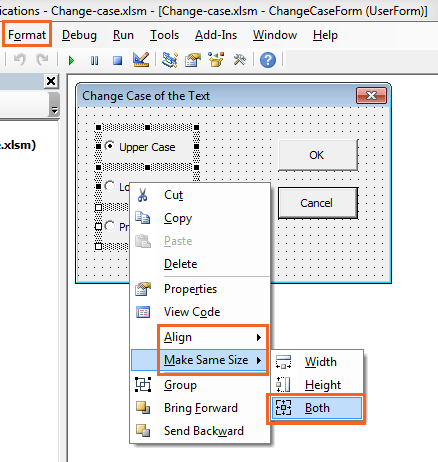 Insert a VBA module by choosing Insert ➪ Module. Open your workbook pressing Alt+F11. Choose Developer ➪ Code ➪ Macros or press Alt+F8. The Macros dialog box appears. Select ShowCaseChangeBox from the list of macros, and then click Run. The UserForm appears. See the following figure. Displaying the Userform that we have created so far. The OptionButton controls work, but clicking the OK or Cancel buttons do not show any effect. These two buttons need to have event handler procedures. Click the Close button (X) in the title bar to dismiss the UserForm. An event handler is a private type Sub procedure that is executed when we perform the relevant event with the object. Now, we shall create two event handler procedures: one will handle the Click event for the CancelButton, and the other will handle the Click event for the OKButton. Event handlers for the OptionButton controls are not necessary. They will be handled internally in the OKButton Sub procedure. 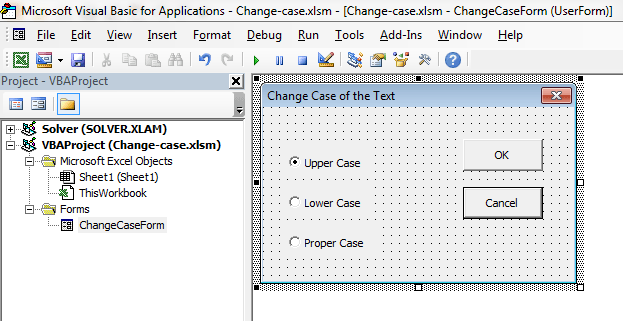 Activate the ChangeCaseForm by double-clicking its name in the Project window. Double-click the CancelButton control. The VB Editor activates the code module for the UserForm and inserts an empty procedure. This procedure will be executed when someone will click the Cancel button (CancelButton). The dialog box will vanish when this code executes. The next step is to write code to handle the Click event for the OKButton control. You can select OKButton from the drop-down list at the top of the module. Or You can reactivate the UserForm and double-click the OKButton control. The VB Editor automatically starts a new procedure called OKButton_Click. The macro demands that the user will select a cell or a range of cells. If a range is not selected, the procedure ends. The procedure then uses three separate blocks. Only one block is executed, dependent on which OptionButton is selected. The selected OptionButton has a value of True. Finally, when user clicks OK, the UserForm is unloaded. Enter some text into a range of cells. Select the range with the text. Select ShowCaseChangeBox macro from the list, and then click Run. The UserForm appears. 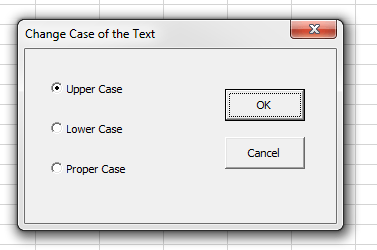 Make your choice (Upper Case, Lower Case, or Proper Case), and click OK.
You must try this macro with more selections, including not connected cells. If you click Cancel, the UserForm is dismissed and no changes happen. Choose Developer ➪ Controls ➪ Insert and click the Button control in the Form Controls group. Click and drag in the worksheet to create the button. The Assign Macro dialog box appears. Select the ShowCaseChangeBox macro, and then click OK. The button is still selected, so you can change the text to make it more descriptive. You can also right-click the button at any time to change the text. ShowCaseChangeBox macro has been assigned to a button on the worksheet. Make sure that the workbook containing the macro is open. 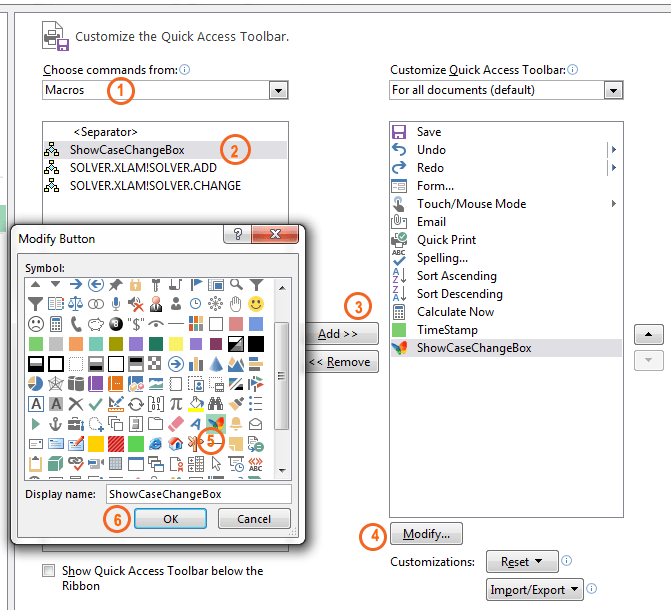 Right-click anywhere on the Ribbon and choose Customize Quick Access Toolbar from the shortcut menu. The Excel Options dialog box appears. The Quick Access Toolbar section is selected. Choose Macros from the Choose Commands From the drop-down menu on the left. Well, our macro is listed there. Select the macro’s name, and click Add to add the item to the list on the right. You can also change the icon. To change the icon, click Modify and choose a new image. You can also change the Display Name. Click OK to close the Excel Options dialog box. The icon will appear on your Quick Access toolbar. Adding the Macro in the Quick Access Toolbar. The macro is added to the Quick Access Toolbar.